IrishTrucker - The impressive MRDL fleet just got even better! The impressive MRDL fleet just got even better! In January, McConaghy Refrigerated Distribution embellished their exceptional fleet with the addition of a stunning new Scania V8 from Road Trucks Ltd. We visited their depot in Ballymoney, County Antrim and met Gavin McConaghy to find out more. The latest addition to the outstanding McConaghy Refrigerated Distribution Ltd. (MRDL) fleet is a striking new R580LA 6x4 2MNA Topline Scania, which will operate from the company’s purpose-built distribution centre at Dervock near Ballymoney in County Antrim. McConaghy Refrigerated Distribution Limited’s impressive fleet of trucks consists of mainly Scania and Volvos in addition to one DAF. The fleet comprises the entire Scania R Series V8 range; the R730, R620, R580 and R520 as well as FH Series Volvos, a Scania P270, a Volvo FM440 I-Shift and a DAFXF105. All trucks in the fleet have been chosen primarily for their driveability, reliability and quality, with the different engine output levels of each truck reflecting the work undertaken and ensuring that drivers always have plenty of lugging power at their feet. 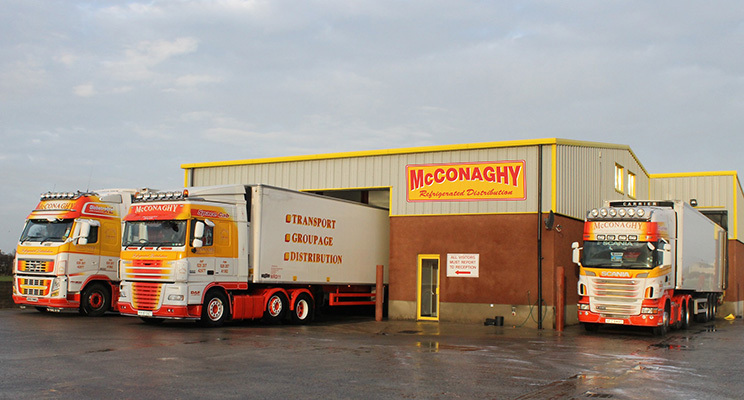 As one of the superior distributors of chilled, frozen and ambient products operating in Ireland and the UK, McConaghy Refrigerated Distribution Ltd. delivery both full and part load solutions, ensuring that the highest possible standards of hygiene, compliance and customer service are met throughout the operation. Remotely monitored tracking systems fitted to the modern vehicle fleet ensure full traceability of consignments from collection to delivery. The 14-strong fleet of multi-temperature-controlled vehicles are regularly updated as part of a continuous renewal programme, enabling the exceptional family-run operation to provide a truly dependable, professional and fully-compliant service. Critically, all of the lorries are owned, bar two on contract hire, and all of the trailers are owned. Operating a fresh fleet keeps overheads down further. “I bought a 212-reg, second-hand R620 from A&M Commercials in Monaghan last year and I drive that one myself,”Gavin continues. “Neil Reid is driving the new one, which is a top-of-the-range unit with all light bars, leather seats, microwave, French freezer etc. It looks the part. When it comes to realising this objective, the striking new Scania will be a major asset.